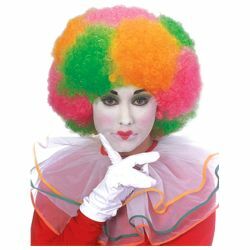 These neon clown wigs offer a brighter option to the traditional clown wig. This wig is perfect for clowns and other costumes that require a colorful wig. The clown afro wigs pair up perfectly with our second skin body suits to create a unique costume. The clown wig neon is available in pink or multi-color and is one size fits most using an elastic sizing band on the inside of the wig. Use the drop-down box below to select a color.